Are you looking for a friendly, safe nursery for your children? Perhaps you need an out of school club for your son or daughter. Smallworld Nursery can look after your children and give you maximum peace of mind while you are at work. "We aim to provide a challenging and stimulating environment, in which all our children can grow and develop at their own pace. Staff plan responsively to children's interests and needs, in order to ensure learning is of greater value to children as individuals. Parents views are also valued to ensure staff, children and their carers can provide a safe, encouraging environment." Smallworld Nursery and its carefully selected childcare staff encourage the development of the children it's in care using the very latest and most trusted techniques available, always ensuring that our staff are working with the welfare and benefit of your children in mind. The nursery provides day-care facilities for children aged birth to 5 years. It is registered with the Care Commission and is also in partnership with Angus Council and takes pride in working closely with them in order to provide the best care to the children of our nursery. We aim to be a resource for families, providing a nurturing environment for young children which has the highest standards of care and education. We continually strive towards being an environment which provides support, time and space to children as their confidence, self-esteem and enjoyment of life develops. We aim to be a home away from home where all are valued, respected and supported. We expect parents to be our active partners in meeting their children's needs. Parents are child's first teacher, you know your child best of all and we need your help to understand their needs and to identify how best to help them. You are always welcome to come into the nursery at any time to see for yourself how your child is progressing. We will also provide you with regular information on what they are doing and how you can ensure they gain the most from this experience. 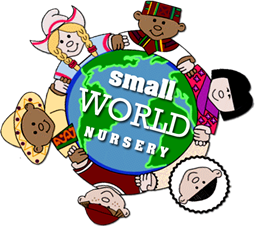 Smallworld Nursery has a secured entry door with only the staff authorised to let parents in and out of the nursery. CCTV cameras are fitted in the various areas including the main door outside. If someone else is picking up your child, you must inform a manager prior to the collection otherwise we will not be able to allow your child to leave the premises. Authorisation for collection of your child must be in writing. The person must be over 16 years of age and will be asked for identification. For further information on any of our childcare services, please call us today using the telephone number at the top of this page or alternatively, please complete the form on our contact us page and a member of our friendly team will be happy to respond to your query.